Charles Herbert Best was born on February 27, 1899 in West Pembroke, Maine. He was the only son of Luella Fisher and Dr. Herbert Best, who were Canadians from Nova Scotia. His father was a country doctor and restless with his country practice moved twice during Best's youth. Best went through public and high school in Pembroke, Maine. After a year at Harbord Collegiate, making up studies in French and Canadian history, he entered the University of Toronto in 1916. He joined the Canadian Army in 1918, after first being rejected because of a heart murmur. He was discharged in 1919, having not seen combat, and returned to the University of Toronto. 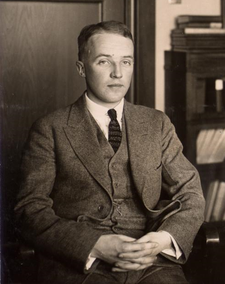 In 1921 Best, having just completed a bachelors with honors in physiology and biochemistry was assigned, along with his friend Clark Noble, to work as an assistant to Frederick Banting who wanted to conduct an experiment that involved blocking the pancreatic ducts of dogs. Blocking the pancreatic duct, through which pancreatic, digestive juices drain into the small intestine, has the effect of destroying most of the pancreas, leaving only the cells of the islets of Langerhans, specialized cells within the pancreas. Banting wanted to isolate these cells in order to look for a hormone that would relieve diabetes. Diabetes is a disease caused by the lack of the hormone insulin. Insulin causes cells to uptake sugar out of the blood stream, and without it blood glucose levels can rise to dangerous levels which cause damage. Banting was only given limited laboratory space and could only accommodate one of his assistants, and there is an apocryphal story about Best and Noble flipping a coin to determine who would be Banting's assistant. Best assisted Banting in operating on dogs to remove their pancreata and then treating them with extracts they had obtained from isolated islet of Langerhans cells, which they called "Isletin". They had a great deal of trouble because their laboratory space, during the hot summer, was not very clean and many of the dogs died of infection. It was not until August that they were able to lower the blood sugar of a experimental dog with injections of isletin, whereas injections of liver and spleen extracts had no affect. By December, 1921 Banting and Best were able to obtain purified insulin by extracting beef pancreas with acidic alcohol. In 1923 Banting and John Macleod, who had arranged for the laboratory space, were awarded the Nobel Prize for Physiology or Medicine "for the discovery of insulin". Best was not included because he had not yet finished his doctorate. Banting was upset by Best's exclusion from the prize and shared his prize money with him. Best succeeded Macleod as professor of physiology at the University of Toronto in 1929 and during World War II he was involved with a program that obtained and used dried human serum. During his later years he served as an advisor for the medical research program of the World Health Organization. Honors awarded to Best include election to the Royal Society in Britian and the Royal Society of Canada, as well as 18 honorary degrees from universities around the world. Best died on March 31, 1978.
the wiki entry has multiple places of inaccuracy. the standard and truly authorative reference of the history of insulin discovery, including the credit that Best should or shouldn't get, is "the discovery of insulin" by Michael Bliss. Dr. Bliss has also published several well studied reports, specifically about Best's role in what happened in 1921-22 during the course of insulin work and his obsession of credit in this major historical moment in the medical history, credit that mostly invented by Best at the expense of those who passed away earlier (including Banting). I am doing a report on this subject and this really helped me alot! Thank you.